Modify Tradition Mini-Quilt – "Modern Beauty"
When I read my partners description of what colors she liked, I immediately knew what I wanted to make. I’ve wanted to make a New York Beauty quilt for ages, but didn’t want to make it out of traditional colors. My partner’s color preferences made this a simple leap, and the image of the quilt sprang into my mind fully formed. 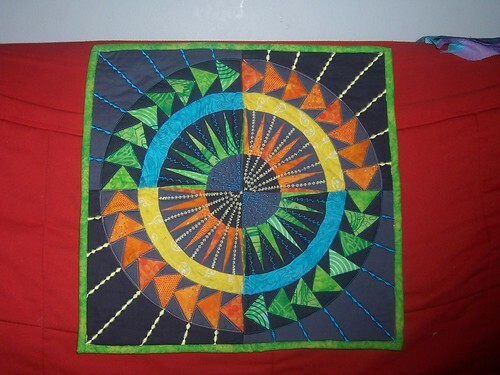 The decision was made, very quickly, to have two shades of gray in the quilt, to contrast against the bright colors I’d decided on: lime green and orange, in at least four different patterns of each color. Right away, I ran into a snag. I opted to use one of Donna Duquette’s free PDF patterns, loving the incorporation of the Flying Geese. As far as modernizing my pattern, this was a two-fer! It’s a beautiful block, but I totally missed that center arc, between the points and the Flying Geese. Not a big deal. Improvisation to the rescue! I decided to keep cool and warm tones separate, and used bright yellow arcs with the orange quadrants and aqua arcs with the lime green quadrants. Very aesthetically pleasing, I thought. Piecing those arcs… I always forget how much I hate doing curved seams through so much bulk until I’m too committed to a project to back out, and that’s what happened this time around. No matter how much I pinned (and accordingly, stabbed myself with said pins) I could not get the $(#(&$ center quarter circles to do a smooth curve. After the third try, I said the heck with it, and moved on. I have to do that occasionally, or forget entirely about deadlines or even finishing in the first place. That left me with the center panel that everyone sees now. I then decided I wanted more aqua and yellow, because those arcs just looked sad and lonely, and there needed to be more aqua and yellow to justify their inclusion in the quilt. So, I pieced a stacked coins border out of 1″ X 3″ strips of the aqua and yellow. I added a 1″ orange border, then tacked on the stacked coins border. I hated it. It detracted so much from the center, drawing the eye away from that explosion of color… I hated it. I spent an hour making like a frog and RIPPITed RIPPITed those two seams out. This left me with the dilemma of how to include more yellow and aqua without taking away from the orange and green. Some rummaging through my thread organizer, and I stumbled across the answer: polyester machine embroidery thread! In aqua and yellow!! I already had the aqua, so I did some playing with test stitching with my sewing machine. Happy, happy, joy, joy! I loved the way it looked, so I experimented in the body of the quilt. The aqua embroidery is not nearly as good as the yellow, but that’s because I realized that I needed to put the spool of thread on the spindle backwards to get a smooth feed through the machine. However, it gives each portion of embroidery a unique look that I like a lot. I already knew that I wanted to bind the quilt in lime green. Some quick auditioning of the fabrics that I used in the quilt itself, and my choice was made. I wanted the bright color, but not the heavy patterning, so I went with the marble-like lime green print. Eight hours of piecing – yeah, it really did take two hours a block. Eight hours of quilting/machine embroidery. One and a half hours to attach the binding, the hanging tabs, and the label. That’s right. Roughly twenty hours for a slightly smaller than 17″ X 17″ mini quilt. Hubby says I try too hard for these swap thingies. Of course, he says that in the same breath that he says he wishes I could keep this quilt for us, lol. I think I have it in me to make another one. I have plenty of material for it!